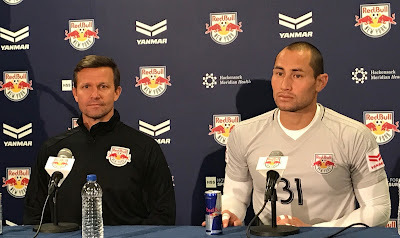 Red Bulls Head Coach Jesse Marsch and new captain Luis Robles at Media Day Tuesday. Photo by Jason Schott. One of the biggest moves the Red Bulls made this offseason was naming goalkeeper Luis Robles their new Captain. At Media Day on Tuesday, Robles said of what it means to him, "To be the captain of the New York Red Bulls is an incredible honor and a great privilege. "I think, even as it's becoming more of my reality, there really hasn't been too much that's changed. The last couple of years, from the coaching staff, there's always been this challenge to continue to develop as a leader, and so, over the last few seasons, what I've looked to do each and every week is to set a good example by the way that I train and then also the way that I conduct myself in the locker room. "So, when using that as my foundation, I started to find a little more comfort zone in the messages that I share, the way that I use some of my own personal anecdotes, and then it's sort of grown into its own thing, to the point where things that used to be uncomfortable are no longer, where I feel that when I stand before the group, it's not necessarily about proving myself, it's just about sharing and being authentic, and so for me, the two objectives remain the same, and that's to be able to go out each and every day and not focus on the result, but the effort level that I bring to training and games. "Then, the second objective is simply to be the best teammate that I can be, and though the capacity's a little greater from a leadership role, I think fundamentally it's the same. Try to be the type of guy that you want as a teammate, the type of guy that is encouraging, that is honest, and genuine." Since joining the Red Bulls midway through the 2012 season, Robles has accrued 49 MLS regular-season shutouts, 508 saves and a record of 80-51-43. Robles's 49 shutouts place him tied for 12th with Bill Hamid all-time in MLS. It is very rare for a goalkeeper to be named a captain so the Red Bulls could be starting a trend. Red Bulls Head Coach Jesse Marsch said of choosing Robles to be the third captain since he took over in 2015, "Luis is a natural fit. He has leadership qualities. He thinks carefully about who he is, how he does things, how he treats people. From a work ethic, there's no better example on our team. He's the first guy in training, he's the last guy out there. He takes shots from the young guys until an hour after training if need be. So, when you're starting to now think about, how are we moving forward with this, Luis, he said, it hasn't changed much. "He can kind of help in tough moments make everybody feel secure with the fact that we're moving in the right direction. He can say the right things, he can do the right things, and then on the field, he's become a bigger and bigger presence in terms of his communication, the types of things he says before games, the types of things he says at halftime, after games, during games, it's just I've seen him grow more and more each year and it's something that I think we're all very proud of in terms of his leadership. "I'm excited that he's captain. He knows that there's a lot of talking points around the climate of being the New York Red Bulls captain. He's prepared more than ever to lead this team. The other contender to be captain was Bradley Wright-Phillips, who is arguably the greatest offensive player in MetroStars/Red Bulls history. Wright-Phillips has scored 127 goals since he arrived in New York in 2013, including an incredible 33 in 2015 and 32 in 2016. He took a minor step back last season with 29. BWP said of Robles being named captain, "I'm happy for him. Luis is a born captain. The way that he talks, how he lives his life, how he is around the club, he's a very good choice. I'm happy for Luis. "He's got a great personality. I think he's born to be a captain. He leads, you know, what he says, how he carries himself, and what he's done on the pitch. It's a perfect appointment." Marsch said of how Wright-Phillips and Robles balance each other out as leaders of the team, "He also has Brad (Wright-Phillips) and the type of guy Brad is. Actually, I think that their leadership characteristics complement each other in a really big way. Brad is a guy that is more about working hard every day, doing whatever it takes for the team, leading because he's humble. He has an approach for a superstar that everybody really admires, and then Luis is the one who can stand in front of the group." Robles shows those qualities whenever he leaves his crease and runs out as far as midfield to gather his teammates together and make a point. That is something Wright-Phillips noticed as a reason Robles is the new captain, and said, "That may have something to do with it." The Red Bulls host Olimpia on Thursday night at 8 pm at Red Bull Arena in the second leg of the CONCACAF Champions League Round of 16. They tied 1-1 last week in Costa Rica, with the Red Bulls getting a very important road goal. They open the MLS Season on Saturday, March 10 at 7 p.m. against the Portland Timbers.